Across the date line it is World Wide Quilting Day. What will you be doing today? I know I will be working on umpteen works in progress while enjoying the beautiful Autumn weather here in Queensland. 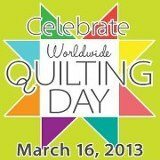 To celebrate, visit the World Wide Quilting website or facebook page and enter all the fabulous giveaways. The Quilt Show are having a mega giveaway too, including a Bernina sewing machine. 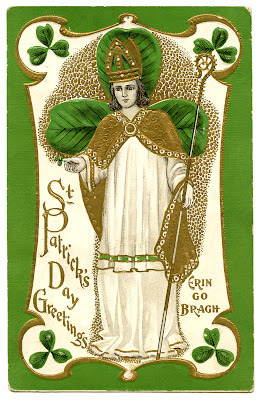 On this side of the world it is St Patricks Day. It will be green pancakes for breakfast today! I am working on the works in progress today too. I finally quilted a quilt top that I start back in June last year. The plan is to bind it today and then I can finally cross it off my long list! The spring weather here in Austin, TX is beautiful. I am celebrating the day with a field trip to a fabric store. Yeah. My husband's favorite holiday is St. Patrick's Day since he is Irish and his name is Patrick.